Starting one of my favorite units of the year: permutations, combinations and the binomial theorem. I stumbled upon this article proclaiming the arrival of 140 Million Burger Combinations, heading to New York City – and when I see combinations in the news, it’s time to investigate. The article comes from 2010 and heralds the opening of an exciting new direction in burger construction (which has since closed). 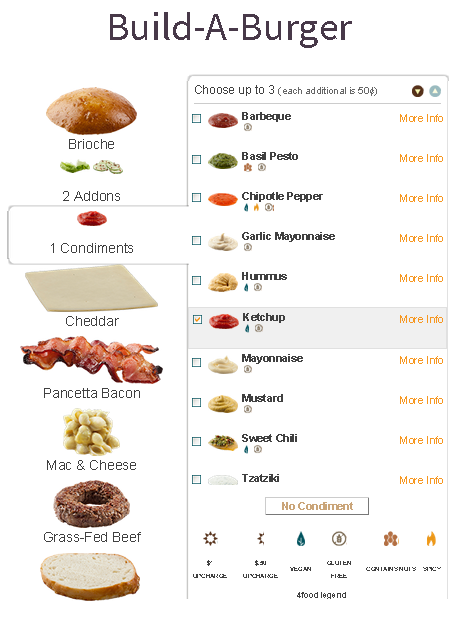 The website for 4food is sill active for now, and has a cool applet where you can build your own burger. There are many decisions to be made, and some exotic choices (a scoop of roasted brussels?). I offered students the opportunity to create their own burger, with stations set up on my laptop and on my ipad. Much pro-con debate over the appropriateness of burger pickles ensued! But multiplying these numbers does not get us near 140 million…so what gives? My classes will explore this problem deeper in the coming days, but for now some seeds have been planted. Soon, we will consider the possibility that you could select multiple condiments, cheeses, and scoops, and work to derive the final count. The Tastee Donut Shop charges eighty-nine cents for its Mix N Match selection, which allows you to select any three doughnuts from among the following varieties: plain, maple, frosted, strawberry, blueberry, vanilla, chocolate, glazed, and jelly. How many different Mix N Match selections are possible? Here is a printable version of this problem you can share with classes. Buy 2 of one type, a 1 of another (hard): we need to pick two flavors. But picking 2 glazed and 1 jelly is distinct from 2 jelly, 1 glazed. Order matters. Compute 9 pick (permuation) 2.